“The Lady Of The Lake represents the highest order of respect for yourself and the manner in which you operate within the world around you. She is the harsher element of truth, where denial is swept away by a tidal wave of events. In the ancient legend of Avalon, The Lady Of The Lake presented Merlin with the sword of truth, which had been claimed by Arthur, who became High King of Britain. The magic that welded this metal was fired by the will of the God and/or Goddess. Consequently, when The Lady Of The Lake appears, she demands nothing short of total truth and integrity; and she asks you to be mindful of all the signs, signals, and omens that present themselves to you. This is not the time to second-guess. If a signal appears, be assured that a challenge has been presented. Moving forward without acknowledgment of the challenge will result in unnecessary difficulties. If the signal is to move, she pushes you to act. Do so, for a victory is imminent. Regardless of your question, the message is to take care when The Lady Of The Lake appears, as serious business is at stake. 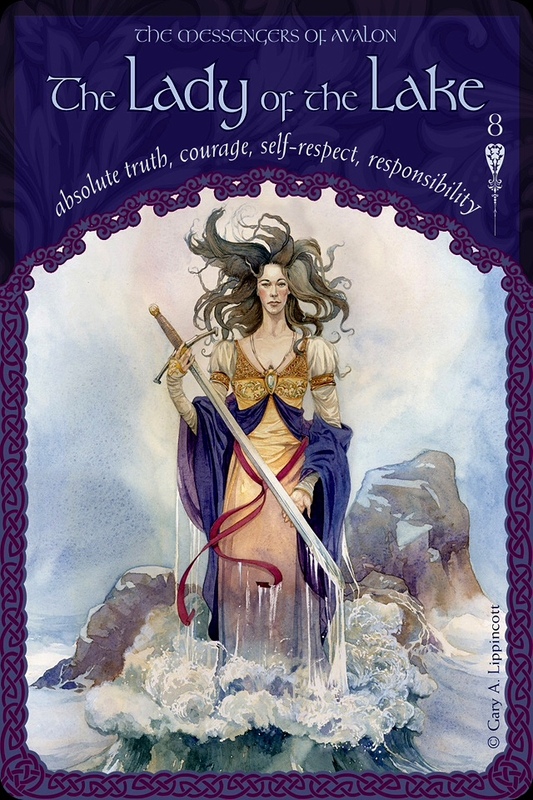 The Lady Of The Lake reminds you of your personal responsibility in shaping your reality and its consequences. Discretion, authenticity, value, honesty and morals are the message of this card. Know your heart and trust your Soul to lead you down the path to the highest good. Do not be distracted by the drama but rise above it to gain a new perspective. See the signs around you as your angels and guides show you what you need to see; have faith that your intuition is true and that although there are lessons to be learned, compromising your own values is not an option. Listen to your gut instincts and follow the guidance that comes from within. Watch for red flags and act accordingly. Steer clear of corruption and take responsibility for the creation of your own life. If you are finding yourself in a pattern, it is something that you have created and only you can find a way to break free. Have the courage to move forward, away from what no longer serves you. Settle for nothing short of absolute truth and authenticity, of yourself and of others. No games, no power struggles. Time to cut the cords that drain away your precious energy. Leaving only love. Only peace. Equality, support and kindness. True Christ Consciousness. Unconditional love and acceptance.